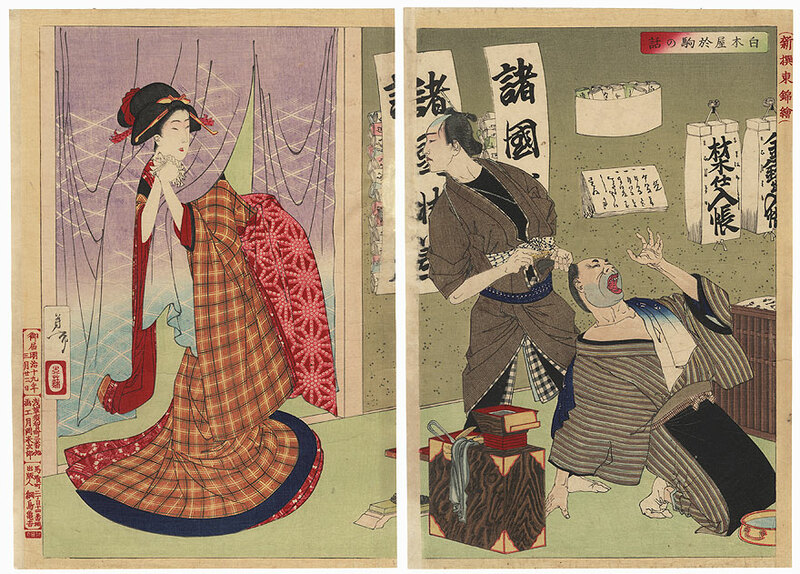 Okuma of the Shirokiya, 1886 - Handsome scene from the play "Tsuyu kosode mukashi hachijo." The young beauty Okuma's widowed mother runs the Shirokoya lumber house, but needs to find her daughter a husband who can take over the business. 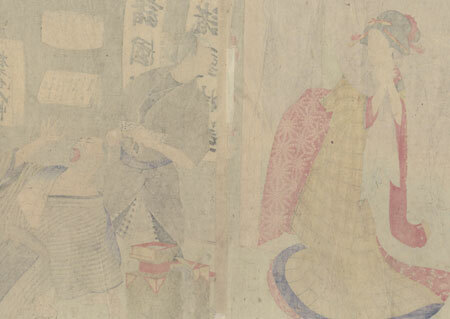 She arranges a marriage for Okuma with a wealthy man, but Okuma is secretly in love with the man's head clerk, Chushichi. She proposes that the pair run away and commit lover's suicide, but Chushichi needs time to think, so when a traveling barber arrives, he agrees to have his hair done. The crooked barber comes up with a scheme to kidnap Okuma and ransom her, so that Chushichi can win favor by rescuing her. Here, Okuma stands in the doorway, anxiously clasping her hands together as the barber roughly combs Chushichi's hair while staring at her. The clerk howls in pain, waving his hand as the barber tugs at his hair. Books and scrolls are hung on the wall and the barber's chest filled with scissors and combs rests on the floor nearby. An interesting illustration with a nicely detailed setting. Condition - This print with excellent color and detail as shown. Two separate panels. Loss and thinning at edges, small hole, repaired. Creasing, slight toning and soiling, a few spots, slight rubbing at edges. Please see photos for details.